This week in fashion, Amazon Australia launches a local fashion offering, Burberry’s Christmas campaign has arrived, Alexa Chung has launched a Net-a-Porter Christmas capsule collection and the Spice Girls have released a charity T-shirt. Find these stories and more as we reveal the top international fashion news of the week. Alexa Chung has released a Christmas capsule collection that will be available to shop exclusively on Net-a-Porter, just in time for the festive season. The 11-piece collection boasts a number of luxurious yet subtly festive looks. Think a picture perfect dress dotted with strawberries and complete with bell sleeves, a luxe velvet tuxedo jacket along with the token T-shirt and a ruby red halter neck dress featuring a bow around the neck. But that’s not all. A number of winter staples, including beanies, scarves and knits will also be coming to the brand’s online store. Chung launched her eponymous label last year and has admitted that although running her own line is “joyful and fun”, she still has a lot to learn about running her own company. “The first year of running the business has been joyful and fun but also the whole thing has been a steep learning curve. Just in learning how to delegate and learning how to be creative under pressure and the fine line you have to tread when you’re trying to marry art and commerce,” she said. I have a thousand puns ready for this caption but I’m starting to sound like a Dad so here’s a photo of me from breakfast with 📸 @jellison22. I had truffled boiled eggs with grilled cheese soldiers which really made all my other meals today look like gruel. I made the jumper it’s on @alexachungstagram if you happen to care, I didn’t make the bag I got it for $20 from a thrift store in New York and that literally never happens to me but I was with angel person Jordy @jordanaskill so I think he magicked it in. Amazon Australia has launched a new storefront featuring more than 150 local fashion brands and hundreds of international fashion labels, with a collective range of tens of millions of products. Dubbed The Local Fashion Store, the range includes brands that have already been available on the site, such as Bras N Things and Bonds, along with many others. Aligned with the launch, marketplace giant has announced a new award that will give 15 up-and-coming Australian brands the opportunity to win a $75,000 marketing package to accelerate their growth. “We are really excited to be empowering some brilliant homegrown talent by putting them front and centre on our fashion store. We know Aussies love to shop local and we want to help them do just that with our Amazon Fashion 2018 Local Brand Award and The Local Fashion Store,” Amazon Australia’s head of fashion, Angela Langmann said. The brand has become the target for widespread criticism for its outdated, limited view of beauty most pervasive in its annual runway show. Sales have fallen as consumer tastes move towards more “body positive” items. Inspired by festive traditions and centred around the film Close Your Eyes and Think of Christmas, Burberry’s new Christmas campaign features a collection of men’s and women’s ready-to-wear pieces and accessories. 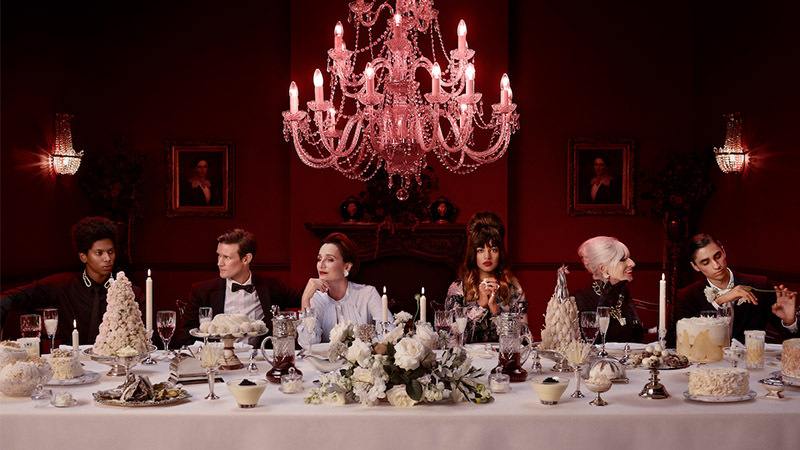 Shot and directed by artist and photographer Juno Calypso, the imagery also offers a preview of Vivienne Westwood’s collaboration with the British fashion house, which goes on sale on December 6. Naomi and Valerie Campbell model the 16-piece offering. “I wanted to portray a more realistic British Christmas, but still shot through a fantasy lens,” she said. “The campaign takes you through all the key seasonal rituals, both good and bad. That’s what brings us together,” Calypso said. Victoria’s Secret’s chief marketing officer has apologised for his “insensitive” comments about transgender models. During a recent interview about whether the company was putting more emphasis on inclusion and diversity, Ed Razek had remarked that the annual Victoria’s Secret shows are a “fantasy” and therefore should not include plus-size or trans models. The ’90s girl group Spice Girls is back, with a tour planned for 2019 (albeit without Victoria Beckham), and new merchandise to embrace. The foursome has released a charity collection featuring a T-shirt, hoodie and sweatshirt, featuring the words “#IWannabeASpiceGirl”. All proceeds will go towards Power Up, a program within Comic Relief’s Gender Justice pillar, which champions equality for girls and women – a cause that has always been integral to the band’s girl power ethos. “Equality and the movement of people power has always been at the heart of the band. It is about equality for all, ‘every boy and every girl’,” said the Spice Girls in a statement. “We recently found out that charities focused on issues faced by women don’t get the funding that they desperately need, so launching a campaign to raise funds for these issues is incredibly important to us and an area we want to support.” Prices range from £19.31 for a T-shirt to £30 for the sweatshirts and hoodies. All pieces are available for purchase now from Represent.com.